"It's one of those tracks people come up to the booth and ask about the most". The quote is from the press release of the Hollywood Seven EP released by Perseo last year, but I imagine it to be a quote straight from Mike Simonetti himself, the initiator of that rather peculiar release. It refers to the rather unknown and only solo single of dutchman Alides Hidding, an uptempo hybrid of electronic disco and AOR-pop with a "classic feel". Simonetti & Johnny Jewel (co-founder of Italians Do It Better with Mike) used this as the closing track of their now legendary Albuterol Mix, but in the live-edited version that has become known as Disconet Dilemma. The concept of the Hollywood Seven EP release, which is quintessentially also the story behind it all, is not that of a random edit package with the main ambition to promote a DJ slash producer. No, the focus here is all on the music and the joy of digging. To tell the story shortly, this track blew up among the Italians Do It Better camp and since they kept finding amazing cover versions of it all over the world, decided to compile them and share it with the world. Do read the full story, which says it all much better than I will, here. 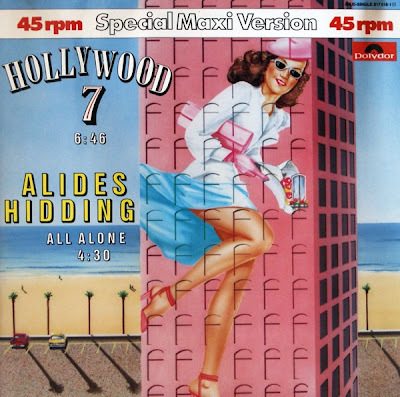 This version of the Alides Hidding track, the 12" Maxi Version, is not (or so I think?) the one that the Disconet Dilemma edit is made from (the title of that edit only refers to the Disconet promo 12", which is hard to find any info on). It's a bit slower and more spaced out in the intro, and the saxophone solos are more prominent.